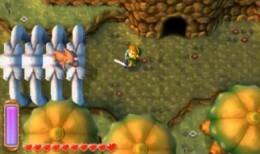 - The Skull Woods are inaccessible via Thieves' Town, thanks to a massive chasm. So how do you get there? It's pretty easy, actually. Go to the elder's house in Kakariko Village and merge with the wall. Shimmy around the rear of the building to find a crack which leads back to Lorule. Voila, you're on the other side of the chasm. - Merge with the building again and shimmy around to the 'front', facing the chasm. There's a Heart Piece in a small nook. - On the left side of this same building is a Maiamai to pry free. 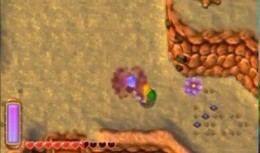 - One screen north of the building with the crack is the area where, in Hyrule, you'd find the Fortune Teller's Tent. There's no equivalent here now, and indeed this is generally a spot to avoid thanks to the excess of cyclopses. Check the southwest wall, though, and you'll find a Maiamai to dislodge. - Make your way east along the chasm. On the southeast corner of the chasm is a pit. There's a Maiamai attached to a wall in the pit. - Walk one screen north. There's a Maiamai hiding in the bushes nestled in the V-shped grove of trees. - Walk northeast to find a plank leading up onto the cliffs. Wander north to find more cliffs overlooking a shack, which, coincidentally, contains another spot for accessing Hyrule. Use the buzzard up here to fly from the topmost ledge, down onto the shack's overhand. There's a Heart Piece waiting for you. - The tree just south of the shack contains a hidden Maiamai. - We'll start with the southwest entrance of the Skull Woods. Straight ahead to the north, on a conspicuous monument, is a crack leading into Hyrule's Lost Woods. Use it as necessary. - To the right of the crack is a small split in the road. Just south of the split are two bushes; brush them aside to find a Maiamai. - Follow the path until you see the next portrait, plainly on display. (No, you can't get it yet. Drat.) Take a left to the north of the portrait and look for a cave ahead. A man inside will offer you something for 888 rupees. Fork over the dough and he'll give you a Golden Bee - as well as the Bottle it's in. Oooooo! Take the Golden Bee back to Kakariko Village and speak to the Bee Man and he'll give you the Bee Badge, making you a friend of bees. No more painful stings! - Continue west through the next ribcage and you'll see a skull surrounded by bushes; beneath the skull is another Maiamai. - Head east to leave the Woods. Enter one of the other two entrances back south and you'll be quickly led to a weather vane beside a distinctly skullish set of stairs. Activate the weather vane and, if you have plenty of health, descend into the depths of the Skull Woods. Yep, it is dungeon time once again. One of the Woods' southern entrances is blocked by a huge rock. Under it is a Maiamai.